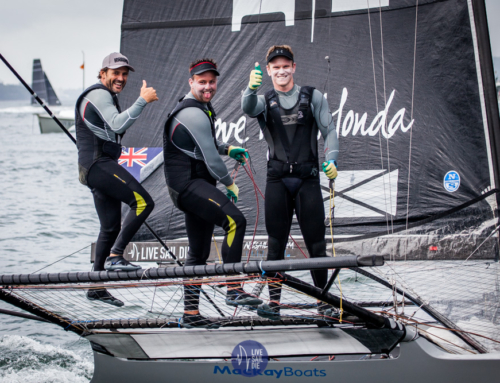 Recently crowned 2015 San Fransico 18 foot skiff champs Yamaha continued on their winning ways on the 3rd day of the RAYC spring series held on Sunday. Racing was held in a 5 to 10 knot South Wester. Racing was around a triangle windward course starting and finishing off North Head providing excellent viewing for spectators. Yamaha did not have it all their own way in the first race. 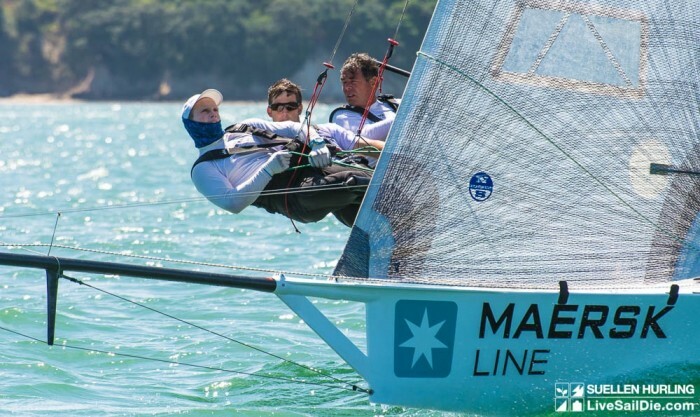 After rounding the top mark Resolution, close to the Auckland port, Yamaha had a narrow lead over Murry England aboard the glistening new boat ASCC and Maersk Line. After setting spinnakers for the run back down harbour ASCC managed to pass Yamaha and Maersk Line closed to one boat length of Yamaha now in 2nd. C-Tech had a blinder of a run and went from well last to catch right up to 3rd place. By the end of the run Yamaha had managed to roll ASCC to reclaim the lead. Followed closely by Mearsk in 3rd. Positions stayed the same for the next up wind with Yamaha extending slightly. The final run turned in to a real battle with Maersk and ASCC once again displaying some good down wind speed and strategy. All 3 boats crossed the line within half a boat length of each other with Yamaha taking the win by less than 1 meter from ASCC in second and about 3 meters from Maersk in 3rd. Events who was sporting a brand new Norths main showed a massive performance jump from last year brought it home in 4th with C-Tech bring up the rear. The breeze built and steadied for the second race. 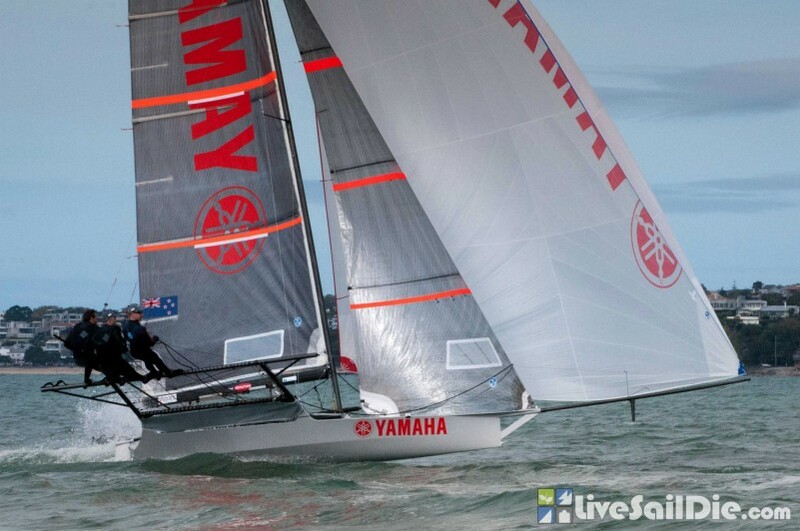 This time Yamaha sorted out their downwind hiccups from the first race and lead around the course for the win. Maersk round the first top mark close in second followed by ASCC, Line Seven and C-Tech respectively. Positions remained the same for the next bottom mark rounding. The play of the day came up the next beat when Line 7 made a smart tactical move tacking well under the port lay line letting the strong outgoing tide do the rest. They made it two within 2 boat lengths of the mark and had to do two quick tacks and a bear away gybe set. They executed the difficult manoeuvre faultlessly rounding the last top mark in 2nd. All the while ASCC and Maersk were pilling on the pressure coming in hot from their fat lay lines. Line 7 managed to hold both ASCC and Maersk as the 3 skiffs blasted down the harbour for the last spinnaker run securing a second place. This is an excellent for the team who are sailing an older boat with an older crew. ASCC came home in 3rd with Maersk 4th and C-Tech bring up the rear. Over all Yamaha took the day, ASCC 2nd, Line 7 3rd, Maersk Line 4th and C-Tech 5th. Great racing. 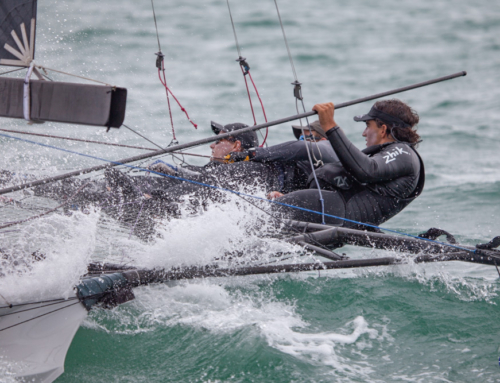 The breeze looks to be in for next Sunday so be sure to get down to Okahu Bay to check out the action.